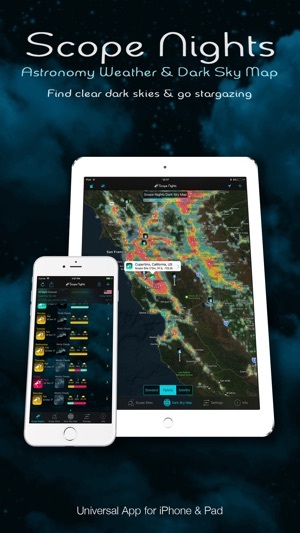 "Every amateur astronomer yearns for clear, dark skies, and this exhaustive app helps you find them." 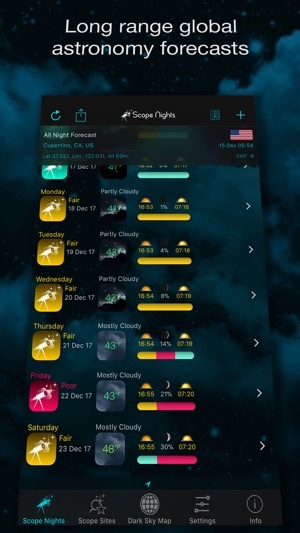 "Several astronomy-oriented weather apps are available, but Scope Nights has become my favorite… it does a fine job of summarizing the data in a clear and understandable fashion." "Conventional weather forecasts meet the needs of Earthly dwellers; news of cloud cover when sensible folk are asleep is hardly required. 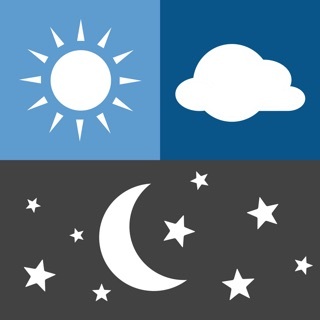 Now via this wonderful App… local forecasts for nocturnal weather… are now available." If you’re a stargazer, astronomer or astrophotographer, analysing conventional weather forecasts for favourable night time conditions can be very time consuming, you just want to know when to plan your stargazing trip or set up your telescope. 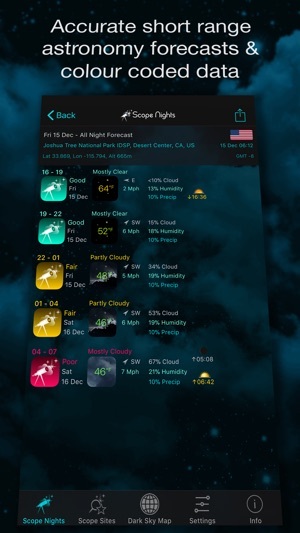 Scope Nights analyses night time weather forecast data for you and shows exactly when and where to go for the darkest and clearest skies, as well as offering customisable stargazing ratings to suit your telescope and observing habits, stargazing notifications, and a detailed light pollution map showing nearby dark sky sites and observatories. Finding clear dark skies and discovering the night sky has never been easier! 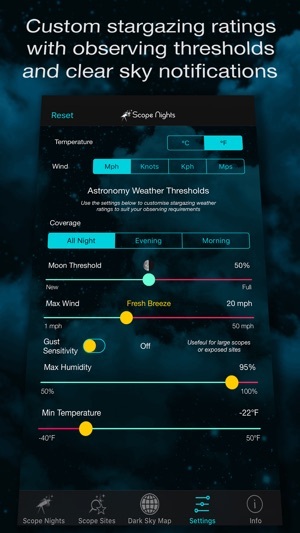 • Create custom stargazing ratings using observing thresholds for moon phase, wind, humidity and temperature. Choose night, evening or morning coverage to suit when you observe, the type of telescope, and the type of observing you plan to do. Scope Nights 2.5.1 is a maintenance release containing minor improvements and bug fixes. Used this app now for two years and is very accurate! Once it said poor and the sky was clear so I set up my scope and by the time of sunset I was completely clouded in! When it says good it’s clear and when it says poor it’s cloudy! Can’t ask better than that. I highly recommend it. 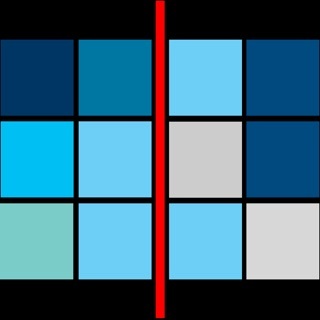 I have had this app for a few years and seen it improve gradually to the point that I find myself using it regularly along with myCSC to plan my observing sessions. I really like how easy it is to get observing forecasts for different locations with important details and a much longer forecast than one gets with myCSC. I inadvertently re-clicked a previous review about this issue. Please delete it if you can. Glad to have this app working again. I’ve been using it for years and it is still the best I have found for planning my observing. Many thanks for your Scope Nights feedback. Unfortunately iOS 11 Location Services was not backward compatible so it caused Scope Nights 2.4 to crash. Despite this setback I’ve managed to release a free app update and Scope Nights 2.5 is now available on the App Store and is fully compatible with iOS 11. If you find Scope Nights 2.5 useful it would be much appreciated if you could update your review. Thanks again & clear skies!